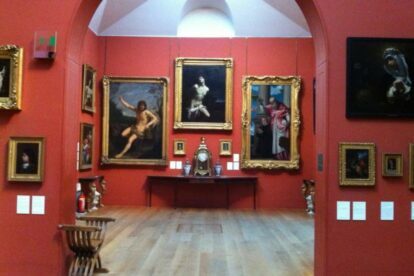 For such a small art gallery, the Dulwich Picture Gallery does feel like a giant in the art world. Within the rooms, the walls are graced with paintings by Rembrandt, Watteau, Poussin, Gainsborough and Canaletto. I often find the gallery’s intimate and relaxed setting gives me more permission to enjoy the paintings. The natural lighting and unobtrusive curators also adds to the peaceful walk through the gallery. The Dulwich Picture Gallery was England’s first art gallery purposely built for public enjoyment. Sir Francis Bourgeois and Noël Desenfans were instrumental in putting together the collection about two hundred years ago. You can thank them yourself – they are buried in a mausoleum in the centre of the museum! The added bonus of visiting the gallery is seeing the village of Dulwich itself. Although it is only a 15 minute train ride from Victoria station and London Bridge, I feel like I am in village straight out of an Agatha Christie novel. Tiny churchyards, a village hall and many quaint shops will greet you as you make your way to the gallery.